Sorry to keep pulling the half-finished comic thing gang. The new overnight shifts are throwing me for a loop sleep-wise. I’m off the next few days though so will try to get more caught up, and this one should be finished sometime tomorrow evening. Also, the lack of backgrounds may make this one difficult to understand until I get it completed, so for some additional context: Amanda ran into the girl’s restroom. She’s slamming and punching stall doors. -EDIT- Comic backgrounds are finished, but some people expressed a liking for the empty whiteness of the unfinished version, so I saved a copy for those that want to see it. Amanda's a southpaw, so her left hook is pretty good. Something I’ve been wondering for a bit…are there rules to when Selkie puts an S at the end of a word, like only after certain consonants or something, or is it just whenever you thought it looked cute and might fit? Dave has said before that he says the lines out loud to see where it fits. He has some rules of where to put it, but it’s more a “it feels like it fits here” thing. I think it’s a side effect of having fangs, making it difficult to pronounce certain parts of out language. It’s basically an accent. Ok I know she just a kid and all but after the BS she pulled on Heather with tattling on her and saying she should be given back to the orphanage she betrayed her first. Why the hell is Amanda not in therapy or something? Her behavioral issues being in sate car, I’m from Australia so maybe its different here but she would be in a concealers office once a week with all that going on. Is “concealers” a typo or is that an Australian word for “counselors” (what we consider basic therapists in the US). BTW, I agree with you. She should be getting therapy of some kind. I think there was a dialog between the social workers that mentioned she was. Strongly agree. She needs help badly. Perhaps it’s an indicator of poor access to services where they live? Concealers office? Is that to hide her away a bit? I read this comic while there was a lot of white area around it. To be honest, I thought that was part of the art/charm of this comic. Bathroom jokes are kind of easy. Being a kid who feels betrayed, hurt, and rage; that has to be hard. I thought with the nothing around her Amanda seems vulnerable and human. The world doesn’t care about her, so she doesn’t care about it. That was how I saw it, for what it is worth. side note: I thought she was slamming the door on her past feelings for Heather. That’s not a bad idea if I ever need to do another abstract/dreamscape strip. Not sure about knuckle damage, but it may interest you to know that in my original draft, she was clenching her fists while running down the hallway so hard her fingernails cut her skin. I would think the punching will leave a bruise though. I’ve punched lots of stall doors and my knuckles never got to that point. Maybe I’m just super tough, or maybe I punch like a girl, but Amanda probably punches like a girl too. Not really. I can tell you from experience that her hands are gonna hurt like a fornicator of maternal figures, but she’ll probably fracture/break her fingers and/or get some nice bruises before her knuckles start bleeding. She’s not exactly punching a rough or sharp surface. On stall doors, however…I agree with the other commentators. I don’t really mind your half-finished posts. It makes the comic that much more intimate with the artist. It’s sort of like those live-streams of drawing that artists do sometimes. It’s cool to watch the process and see the characters come to life. Wait, this is unfinished? except fot the last panel, it felt like a really cool representation of her feelings ^.^ that she’s angry, and taking it out on whatever she’s hitting, while she’s actually slamming away her thoughts of Heather. Honestly I think it works perfectly. You can tell she’s slamming *something*, I just assumed she was so mad she couldn’t even see straight. I may keep this “white-out” version as a link in the commentary since so many people seem to like it as is. This has nothing to do with today’s, but I wonder who straightened out the secretary? 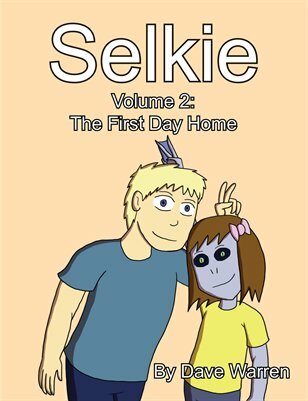 https://selkiecomic.com/selkie327/ Holding up the blanket, “Help me give her some privacy”, versus https://selkiecomic.com/selkie169/ where she lets the half-naked girl sit in the office in front of God and everybody. Appears that somebody jerked a knot in that woman’s head. Ooooh, I’m guessing those very scary people she mentioned in the blanket scene? Look at how angry Amanda is in panel 4. And look at it in the context of what we now know happened to Amanda. Is it just me or is the transcript box replaced with an ad? Or is there just no transcript this time? I knew there was something sinister about Amanda. Dave> I like how you did the backgrounds to the flashbacks! What is that tool you used? It’s a custom Photoshop brush, mixture of Dual Brush, Scattering, and some Texturing settings. Made some low-opacity washes of whites and reds over and on top of each other, with a little black for contrast.